Performances | August 20, 2014 | by Missy Pfohl Smith. All of Rochester could have been lit by the energy Biodance exuded at GEVA’s Nextstage last night. The show reminded me of a collection of excellent short stories. Each unique piece vibrant and well-worked out — good enough to stand alone, but even better as a group. Missy Pfohl Smith, Artistic Director of Biodance, seems to attract all kinds of dancers and choreographers from Rochester and beyond to contribute to her projects. Along with Smith, this one also includes choreography from Heidi Latksy, Bill Evans, Ivy Baldwin, Jeanne Schickler Compisi, Eran Hanlon, and Courtney World. Several of the pieces — especially “Trapped at Tea,” choreographed by Compisi and Baldwin, and “Borderline,” choreographed by World — operated at almost frantic levels. The first featured Compisi and Smith at some sort of mad tea party. Enclosed in a stage-wide ring of plastic forks, spoons and knives, the two began next to each other sipping angrily out of tea cups. More dance theater than pure dance, the two began throwing cups, leaping onto the furniture, and, finally raining plastic utensils down at each other. Makes you wonder what’s supposed to be in that tea; I would have brought in a cup myself if I’d known. In any case, the choppy, truncated movement well-expressed a state of anxiety yet with plenty of humor thrown in. “Borderline” was even more tumultuous. Performed by Laura M. Regna, I’m guessing the piece is about the horrific pushing and pulling you must experience if you have borderline personality disorder. Regna moved as if possessed, flailing her limbs and jerking backwards and forwards in a somewhat-marionette fashion. Regna is a lovely dancer and was able to maintain clean lines and a strong flow of movement in spite of the manic energy trying to control her. “Coaptation” was different from any of Hanlon’s work I’ve seen so far. Faster and with more blatant outward energy, yet with a characteristic eerily beautiful quality, it featured dancers Compisi, Kathy Diehl, and Julie Schlafer Rossette as sweat-shirted, aggressively-moving women who seem distressed over something — perhaps, even hunted. I found the movement to have something of a martial arts type feel, yet there are respites of poignancy as well, for instance in the hovering birdlike-stances the dancers sometimes freeze into. The darkness of the initial pieces was diffused by the premiere of Smith’s “A Moment of Silence,” danced by Allie Alletto. Created in Corfu, Greece, this past July, Smith describes the piece as a meditation of hope and peace. Indeed, its repetitive wavelike motion before an aqua background summons a sense of serenity and then, as physically expressed by the dancer, a start toward some sort of realization. Also to be noted, “Scherzo,” by Evans, offered a lighthearted, large group work set to music by Johannes Brahms. The work combines rhythm, humor, and solid dancing and got the audience smiling along with the dancers. “BioDadaDance for the last day of the Fringe” Jeff Spevak reviews BIODANCE in DemocratandChronicle.com! Each of Rochester’s dance troupes has its own personality. The marvelously entertaining Biodance is impressionistic body rhythm. Precise, synchronized movements and athletic, loose limbs. Often set to electronic grooves, but not always. The black tuxedo shirt and white gloves of Bill Evans’Scherzo moved to the music of Johannes Brahms. A solemn quiet accompanied A Moment of Silence, with Allie Alletto’s grace fighting the turbulent winds of a world in crisis. Indeed, the program noted that the premiere of the dance by the troupe’s artistic director, Missy Pfohl Smith, was dedicated to troubles from Rochester to Syria, from the Ukraine to Ferguson, Missouri. The performance-opening Trapped at Tea offered Pfohl Smith and Jeanne Schickler Compisi presenting a dramatic, gymnastic afternoon of tea drinking. Somersaulting over a folding table, swimming though a floor lined with hundreds of white-plastic eating utensils, it was the most humorous piece of the program — and the most surrealistic, as the two women passed teacup saucers to each other by using their feet. Watching the troupe sweep the plastic forks from the stage afterward was a dance in itself. Had we just witnessed Dance Dada: The Bourgeois Indifference to the Collapse of the Middle Class in the Midst of a World Food Crisis? By pure luck, I was sitting next to Schickler Compisi’s father, Jack Schickler. ROCHESTER, NY – BIODANCE is back in the First Niagara Rochester Fringe Festival this year after its smash hit last year with ANOMALY. “…graceful and inventive. I was repeatedly surprised, delighted, and inspired,” reported City Newspaper. 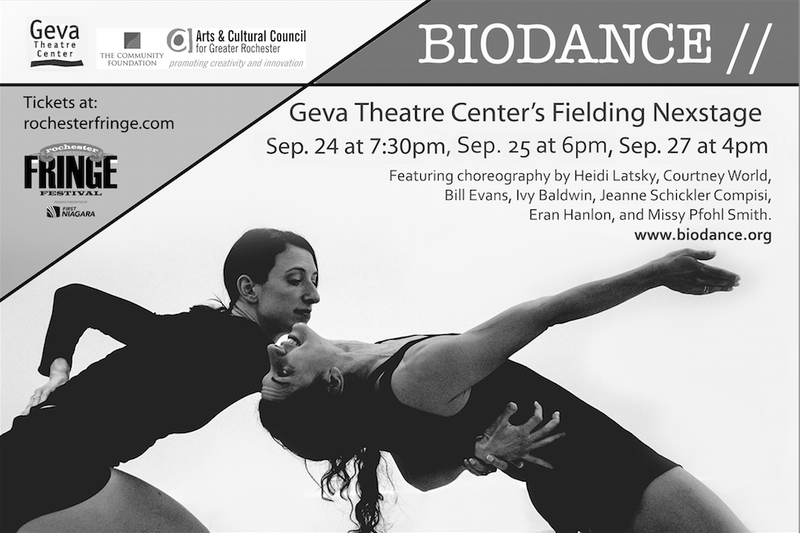 BIODANCE will appear on Sept. 24 at 7:30pm, Sept. 25 at 6pm, Sept. 27 at 4pm at Geva Theatre Center’s Fielding Nextstage, featuring the work of seven national and internationally known choreographers. This is the only time this collection of work will be performed together. All ages will be inspired by cutting edge choreography and expert performance. “BIODANCE is honored to share the innovative work of these current dance icons,” says Artistic Director Missy Pfohl Smith. This is Rochester’s only contemporary dance repertory company bringing repertory from world-renowned choreographers Heidi Latsky, Bill Evans, Missy Pfohl Smith, Ivy Baldwin, Jeanne Schickler Compisi, Eran Hanlon and Courtney World all together in one show! Smith says “The work challenges the dancers’ versatility and virtuosity and it has been invigorating for us to embody such diverse voices. Our audiences, too, have been thrilled by the new direction the company has taken over the past couple of years.” It is through the support of The Rochester Community Foundation and the Decentralization Program, a regrant program of the New York State Council on the Arts with the support of Governor Andrew Cuomo, and administered by the Arts and Cultural Council for Greater Rochester, that this is possible. Audiences will also witness the stunning artistry of BIODANCE performers Allie Alletto, Ellen Tomer Baker, Jeanne Schickler Compisi, Kathy Diehl, Christopher Morrison, Alaina Olivieri, Laura Regna, Julie Schlafer Rossette, Missy Pfohl Smith and Stuart Tsubota. Smith will premiere a new work she created this summer in Corfu, Greece. Peace Offering is a solo for dancer Allie Alletto, shared as a wish for peace in the world. The work is an invitation to find an internal calm so that we can listen to and communicate with one another, crossing boundaries of place, race, socio-economic status and religion, and finding a quiet and honest celebration of difference. Though Rochester said goodbye this summer to Rochester dance legend Bill Evans (he relocated to Rhode Island), his work will remain in the repertory of Rochester-based company BIODANCE. The company will reprise Scherzo, an original work created for the BIODANCE by Evans in 2012 to the music of Brahms. Former Bill T. Jones soloist Heidi Latsky, known internationally for her work with differently abled dancers, also set excerpts of her critically acclaimed Solo Countersolo on the company. Heidi has garnered awards and commissions throughout the world and is the first choreographer selected to participate in the Dance for Film on Location at Montclair State University project, underwritten by The Andrew W. Mellon Foundation. Ivy Baldwin and Jeanne Schickler Compisi created a wild duet, Trapped at Tea, which will be performed by Compisi and Missy Pfohl Smith. Baldwin was recently awarded a Guggenheim Fellowship for Choreography. BIODANCE is thrilled to hold a performance of repertory by internationally known choreographers on Friday, Sept. 5, 2014 at 12:30pm for the Senior Center at Community Place at 145 Parsells Ave in Rochester, NY. This concert, along with a dance workshop series for the seniors, is supported by the Rochester Community Foundation and the Decentralization Program of the New York State Council on the Arts, with the support of Governor Andrew Cuomo, and administered by the Arts and Cultural Council of Greater Rochester. On Saturday, October 18, 2014 BIODANCE is honored to perform as part of a Friends Helping Friends Benefit Concert at Asbury Methodist Church, 1050 East Avenue, Rochester, NY.